I am a doctoral student at the University of Florida but was born and raised in Blacksburg. 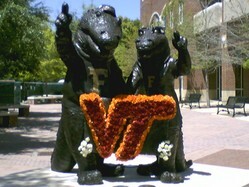 This statue is of UF&#39;s mascots (Albert and Alberta)with a VT. It was very nice to see UF&#39;s support after April 16th.